One of North America’s most sought after choral conductors, Professor Jing Ling-Tam, Director of Choral Studies and Coordinator of Vocal Arts at UTArlington has garnered international recognition in North America, Europe and Southeast Asia. 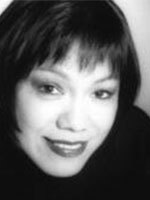 Prof. Ling-Tam served sixteen seasons as Associate Conductor/Chorus Master for the Ft. Worth. Opera Association.. She was on the faculty at the American Institute of Musical Studies(Austria) for eleven summers. Some of her recent appearances include concerts with the Taipei Symphony, the Coro de Madrigalistas(Mexico City.) and workshops/lectures for Children’s’ Palaces of NingBo, Xiamen and GuangZho, China, Festival 500(Newfoundland, Canada) Ontario Vocal Festival & Choral Conductors’ Symposium,(Toronto,) Southwestern ACDA Convention(St. Louis), Disney Honors National Choral Invitational(Orlando),International Youth Choral Festival(Hong Kong,)2006 Missouri ACDA, 2005 Salzburg Pedagogical Institute Winter Workshop and 2007 Third World Children’s Choral Festival.